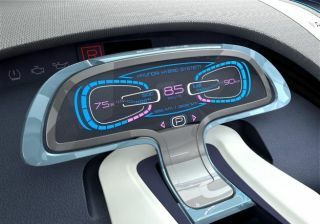 Hyundai has shown off the future of in-car information at the recent Frankfurt motor show – using transparent OLEDs instead of the humble speedometer. The concept looks a lot closer to reality than usual though, as it uses a model from NewView Kolon, a Korean OLED developer. Pictures by Car Advice, from the recent Frankfurt Motor Show have turned up, showing the new system in render and in the car itself. The heads up display (HUD) shows a variety of information when switched on, such as fuel efficiency, distance and gears, similar to a normal car. But the touchscreen display will also be used for entertainment and satellite navigation as well, all in high-resolution colour. And the coolest thing is that when you switch off the car, it just goes back to a normal-looking piece of glass. So it might not be the most useful application for the technology (put it in the windscreen, and you'll be talking) but there's no denying it's pretty cool, and that's something hybrid cars are still very much in need of.